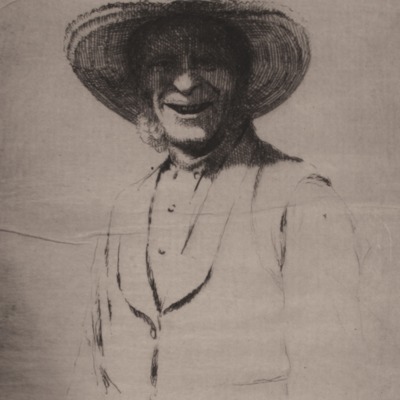 Drypoint portrait of a man from waist up, smiling, with hat. Titled "Inventory of Artwork in SUNY Collections". It says that the work is part of "The Student Collection". The signature is in the lower right hand corner, it is signed "Newton A Wells 1888". The year of acquisition is c. 1930 and the date of attribution is 1888. Newton A. Wells, “Untitled ,” LLB Galleries, accessed April 23, 2019, http://artgalleries.milne-library.org/items/show/105.